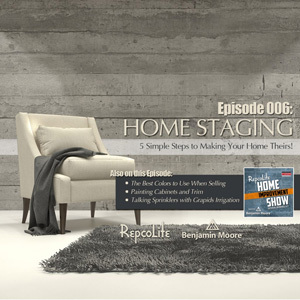 EP06 – May 6, 2017: Simple Steps to Home Staging and More! Home staging. We’ve all heard about it, but how many of us know how to do it? On today’s episode of the RepcoLite Home Improvement Show, we list 5 simple steps that will help you make your home as appealing to new buyers as possible. We also discuss the best colors to choose when painting your home for resale. Do you go with neutrals and look like every other house out there? Or do you roll the dice and try to stand out with color? We have the answer to that and more on today’s episode. Segment 1: 5 Simple Steps to Home Staging! Spring is the best time to put your house on the market.....along with everyone else in town! So how can you set your house apart from all the rest, while getting top dollar? Home staging is a great solution if you are planning to sell your home. It helps potential buyers to see your house in a different light. And it isn't as bad as you may think. We've got 5 simple home staging tips that will help you put the best house forward. Home Staging Can Help Your Home Sell for More! Paint color is a hotly debated topic whether you're selling your house or not. We help you decide between a neutral or dramatic color scheme. And tell you the last two important steps to home staging. And, because we have a few extra minutes, Dan decides to tell us about his brick chimney leak and tells us about a great product that will seal the brick and stop the water before it's too late! We always ask that our listeners email us with questions and Lisa emailed a great one about painting cabinets and trim that we think many other people may have as well. We thought about just answering, but we had a few questions. So, we asked Lisa to call us with her question so that we could give her the best possible answer. Hence, our first caller! On today's Ask RepcoLite segment, we've got the answers for Lisa's questions! Segment 4: Get Golf Course Green Grass! While we have had a lot of rain recently, at some point it will dwindle and we will be forced to create our own rain to keep our grass green. I have spent a lot of time dragging a hose and sprinkler around to keep everything that SHOULD be green from turning brown and dying. It's hard work! Aaron Katerberg from Grapids Irrigation stops by to tell me what it takes to put in a new sprinkling system. And Dan asks about upgrading his old system so he can stop jumping out of bed in the middle of the night to turn off his sprinklers when he hears rain! EP05 - April 29, 2017: One of a Kind Furniture and More!